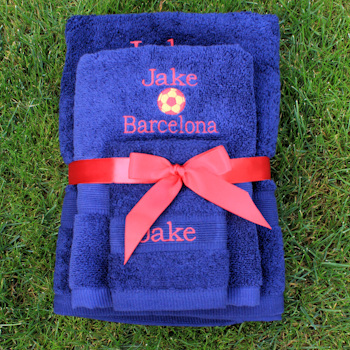 Personalised towel with a classic football motif and your choice of name and football team custom embroidered. Personalised towel with a classic football motif and your choice of name and football team custom embroidered. A unique and useful gift for any home, gym or spa, birthday anniversary or fathers day gift. Personalised with your choice of text, A name and or a team name. Please tell us the two main team colours you want and we'll use the closest embroidery thread colour we have for the stitching. Please note: At Amys Gifts we do our own embroidery work especially made to order and aim to get orders dispatched within 48 hours.